Where should I start with makeup? My product recommendations focus mostly on drugstore items, as I believe it’s best to start off with mostly drugstore makeup (much of which is very good) so that you can learn your likes and dislikes in terms of colors and formulas without a huge investment up front. I do think it’s worth it to spend more on foundation and concealer, especially to find a good match, so those recommendations include more mid-to-high-end products. While the amount of information below may seem overwhelming, don’t feel like you have to rush out and get all of the different products listed here! If you’ve never worn makeup, try out new things one by one, depending on which features you want to focus on. Keep in mind throughout that you don’t need to follow every makeup “rule” you read, and there are no “have to”s in makeup. For instance, you don’t “have to” wear foundation – if you feel you don’t need it, great! You also don’t “have to” only wear bright lipstick in the spring, or wear only warm colors if you have warm undertones. The guidelines I’ve listed here are just that – guidelines. This entry was posted in Uncategorized on June 25, 2014 by 25til9. Of course, this list isn’t meant to be absolutely prescriptive or to box you in – it’s just a starting point. Every single one of these colors may not work for you; consider your skin undertone and how bright or muted your coloring is. For instance, bright teal may not look right on someone with muted coloring, and olive green may look muddy on someone with bright coloring. See here for more on this. 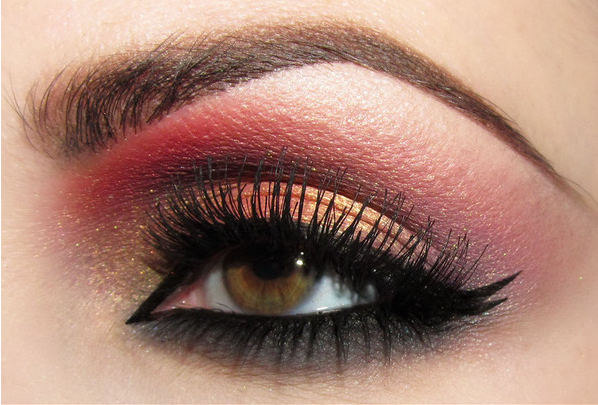 And there are many ways to incorporate these eyeshadow colors into your looks. 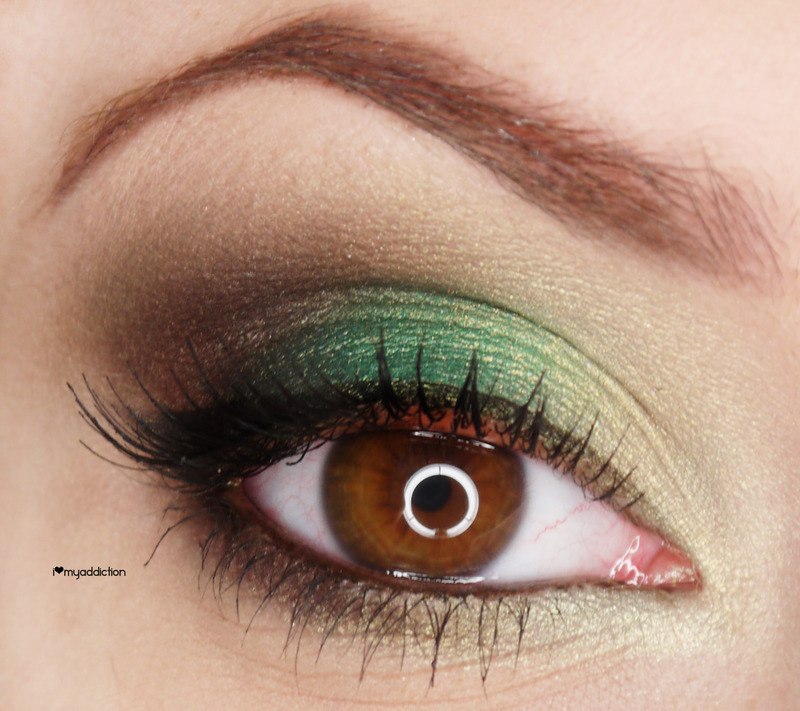 You don’t need to put a green shadow all over your lid; you can use it on just part of the lid and blend it into more neutral colors, as in the image above. See here and here for some ideas on putting together eyeshadow looks. I’ve also put some example images in this post. Below I’ve listed specific eyeshadow options, with different finishes and from different price points, for each color group. I’ve noted the finish and how light/dark each color is in parentheses. One quick note – if you have darker skin, the shades labeled as light to light-medium may look ashy on you. This entry was posted in Eye makeup and tagged eye makeup, eyeshadow on January 1, 2015 by 25til9. Of course, this list isn’t meant to be absolutely prescriptive or to box you in – it’s just a starting point. Every single one of these colors may not work for you; consider your skin undertone and how bright or muted your coloring is. For instance, bright gold may not look right on someone with muted coloring, and warm brown may look muddy on someone with bright coloring. See here for more on this. 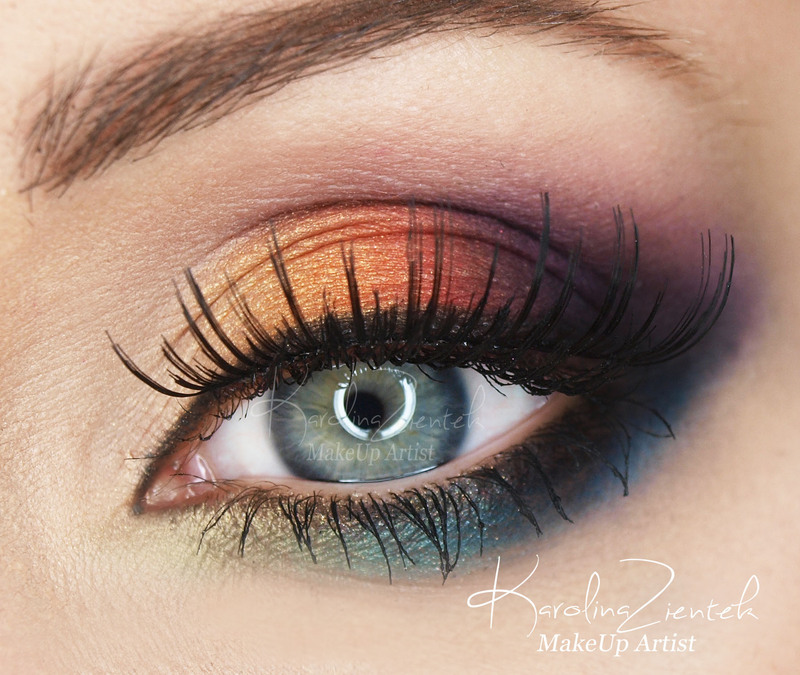 And there are many ways to incorporate these eyeshadow colors into your looks. You don’t need to put an orange shadow all over your lid; you can use it on part of the lid and blend it into more neutral colors, as in the image above. See here and here for some ideas on putting together eyeshadow looks. I’ve also put some example images in this post. This entry was posted in Eye makeup and tagged eye makeup, eyeshadow on December 30, 2014 by 25til9. If you have hazel eyes, those colors can bring out the green in your eyes, and gold can bring out any gold flecks in your iris. Of course, this list isn’t meant to be absolutely prescriptive or to box you in – it’s just a starting point. Every single one of these colors may not work for you; consider your skin undertone and how bright or muted your coloring is. For instance, bright violet may not look right on someone with muted coloring, and warm brown may look muddy on someone with bright coloring. See here for more on this. And there are many ways to incorporate these eyeshadow colors into your looks. 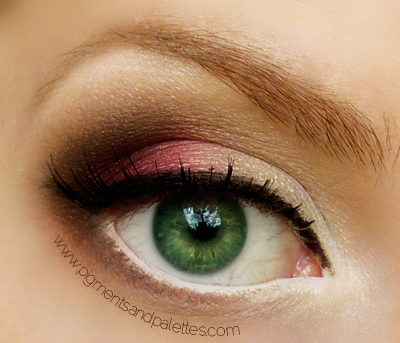 You don’t need to put a burgundy shadow all over your lid; you can use it as an accent color, as in the image above. See here and here for some ideas on putting together eyeshadow looks. I’ve also put some example images in this post. You can echo those characteristics in your lip color choices. Let’s go into more detail on each. This entry was posted in Color theory, Lip products and tagged lip products on November 29, 2014 by 25til9. Blush adds color to your cheeks, which can help make you look healthier if you don’t have natural redness there. Also, if you’re wearing foundation, blush will help keep you from looking washed out. Blush comes in cream and powder formulas. Cream blush – can be applied with fingers and blended out with a stippling brush or fingers. Cream blush is especially good for dry skin. Also, you can layer powder blush on top of cream blush to increase wear time if that’s a concern for you. Note that cream blush should never be used on top of powder foundation, as it won’t blend out well over powder. Powder blush – applied and blended out with a blush brush. If you use liquid foundation, particularly if you have oily skin, be sure to powder your face before applying powder blush; it’ll blend out more easily that way. This entry was posted in Face makeup and tagged blush on August 23, 2014 by 25til9. Hakuhodo is a high-quality manufacturer of makeup brushes which are hand-made in Japan. This post provides detailed information about their brushes, along with general information on how to choose makeup brushes. This entry was posted in Brushes and tagged brushes on August 20, 2014 by 25til9. 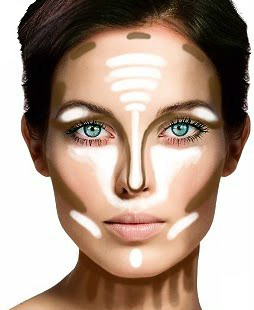 Highlighting and contouring are used to “sculpt” your face as shown in the diagram, by accentuating the natural high points/shadows in your face. This is based off the simple principle that light colors bring an area forward, while dark colors make an area recede. So you would apply light colors to the areas of your face that are naturally prominent, while applying dark colors to the areas of your face that naturally recede. Highlighting is applying a liquid or powder a few shades lighter than your skin on areas you want to bring forward, like the tops of the cheeks and center of the nose. This can make your face look more “glowy.” If you just want to highlight your cheekbones, you could use something matte or shimmery, whereas if you want to sculpt your whole face, including all the highlighted areas in the diagram, a matte product is best. While some people even use concealers, that can look cakey fast due to the high coverage in those formulas. Contouring is using a powder or cream a shade or two darker than your skin in areas you want to recede, typically the perimeter of the face, cheekbones, jaw, and sides of the nose. This can help to define your cheekbones and make your nose look more narrow. The best color to use for contouring is strongly dependent on your undertones. If you have very warm undertones, something warm (like a matte bronzer) can work, while a cool-toned or taupey color might pull blueish or purplish on you (you can see this effect in this swatch of NYX Taupe on warm-toned skin, where it looks a bit purplish). If you have very cool undertones, something cool-toned (gray or cool taupe/brown) can work, while a warmer color might look too orangey. If you have more neutral undertones, try a neutral brown like Urban Decay Naked eyeshadow (for light skin) or Kevyn Aucoin’s Sculpting Powder (for light to medium skin). This entry was posted in Face makeup and tagged contour, highlighter on August 13, 2014 by 25til9.